To reduce Mater-Biotech’s environmental footprint and its disposal expenses, Fluence added waste-to-energy technology to the plant’s capabilities, reinforcing the company’s pursuit of innovative, environmentally friendly technologies. When Italian biochemical company Mater-Biotech, a subsidiary of Novamont, bought an existing facility and was refurbishing and expanding it, it looked to Fluence to design and implement multiple solutions for its water and wastewater treatment needs. This case study shows how Fluence provided the company with an effective turnkey operation that includes water treatment, wastewater treatment, and waste-to-energy technologies in three treatment trains, all in only one year. In today’s world, businesses in all industries are focused on sustainability, even as they seek ways to operate efficiently, meet permitting regulations, and make a profit. The technologies chosen for this project reflect the customer’s reputation for innovation, while also addressing its desire to reduce costs and become more sustainable. Mater-Biotech produces 1-4 Butanediol from renewable sources. Part of Novamont’s sustainability model is the regeneration of local areas, including giving new life to existing facilities. When the company decided to refurbish a factory in Adria, Italy, it contacted Fluence to design and construct a system that could produce primary water for manufacturing from local wells, and a wastewater treatment plant capable of treating the biomass remaining from its fermentation process. To reduce the company’s environmental footprint and disposal expenses, Fluence incorporated a third solution: Waste-to-energy was added to the plant’s capabilities, reinforcing Mater-Biotech’s pursuit of innovative, environmentally-friendly technologies. While Fluence had previous experience in the biochemical industry, Mater-Biotech’s innovative processes and complex waste streams posed a new challenge. One initial goal was to properly characterize the waste streams to determine which technologies would be the most effective. Perhaps the greatest challenge was that the client needed to go from commission to completion in a very short time frame. The project was awarded in March 2015 and completed in August 2016. Three treatment trains were developed to meet the client’s goals, using a combination of existing and new equipment. The primary water system provides water for use inside the plant. The treatment process which involves removing methane from the well water was successfully tested for two months using a Fluence pilot plant before full scale implementation. The wastewater treatment plant is a membrane bioreactor (MBR) plant, which processes high-organic-load effluent from the production plant, as well as the liquid digestate from the anaerobic reactor. In addition to the MBR wastewater treatment stage, Fluence added a biodigester to treat sludge generated by the process. The design was based on Fluence’s waste-to-energy solutions for treating high chemical-oxygen-demand wastewater from animal slaughterhouses, and other industrial plants. 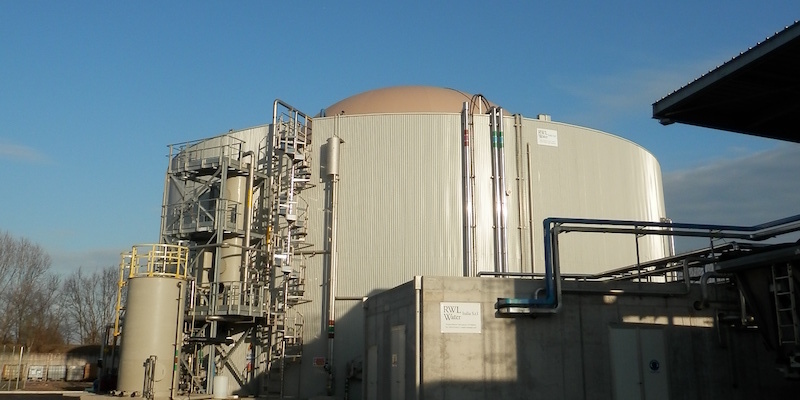 This stage uses a continuous stirred tank reactor (CSTR) anaerobic digester with a volume of 5,000 cubic meters. It’s capable of treating wastewater with applied organic loads of between 5 and 6 kilograms of COD per cubic meter per day. Fluence has successfully delivered and commissioned the water and wastewater treatment facilities within a very tight timetable. They ensure that the refurbished manufacturing facility can operate in strict compliance with local regulations while reducing its carbon footprint, and optimizing operating costs.